On this day in 1955, General Electric introduced the first reproducible, verifiable, witnessed synthetic diamond ever to be created. The synthetic diamond was a breakthrough in chemistry and revolutionised the use of diamonds in industrial abrasives. Leading up to 1955, the idea of creating the naturally occurring hardest substance on Earth in a lab seemed impossible. Chemists had tried, with mixed success, to create a man-made diamond. In 1941, GE announced it would dedicate funds and resources to pursue diamond synthesis. In 1951, a high-pressure diamond group including F.P. Bundy, H.M. Strong, and Tracy Hall, was formed at the Schenectady Laboratories of GE. The team built a Diamond Press, an ultrahigh-pressure apparatus, designed to concentrate and sustain tremendous pressures in a small area–just the conditions needed to create a diamond. In the press, a doughnut-size chamber was surrounded by conical pistons that produced pressures of 1.5 million pounds per square inch and temperatures of 2,760°C. Scientists placed metal and carbon inside the doughnut chamber, applied an electrical jolt that melted the metal-carbon mixture and initiated diamond crystallisation. Extremely high pressures and temperatures within the chamber replicated the centuries-long geological process that creates diamonds in nature. After 10 to 20 minutes of operation, scientists shut down the Diamond Press and peered inside the chamber to gaze at the first man-made diamond ever made. “Man-made diamonds, the climax to a 125-year effort to duplicate nature’s hardest and most glamorous substance, were displayed here today,” trumpeted GE’s press release dated 15 February 1955. The synthetic diamonds produced by the GE’s diamond press were found to have the same crystal structure, composition, and characteristics as naturally-occurring diamonds, though they were considerably smaller. The first production runs produced diamonds of up to one-tenth of a carat, ideal for industrial applications. Synthetic diamonds like GE’s offer an alternative to the vagaries of the diamond trade, which has historically been highly susceptible to corruption, conflict, and illegal operations. Recent media coverage has drawn attention to the problem of conflict, or blood, diamonds—diamonds that are sold to fund the illegal operations of rebel, military, and terrorist groups. Diamond workers in African countries like Sierra Leone, Angola, Liberia, and the Democratic Republic of Congo, have been terrorised, mutilated, and killed by warlords controlling the local diamond trade. In 2000, concerned communities began a campaign to track the origins of all rough diamonds and put an end to conflict diamond sales. The result was The Kimberly Process Certification Scheme, an international effort to rid the world of conflict diamonds. 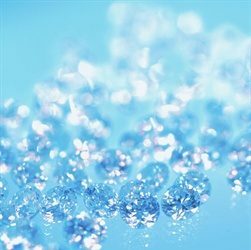 Photo Caption: Synthetic diamonds are used in a variety of industrial applications, and provide an alternative to purchasing mined diamonds with unknown sources.